Fuxian lake has a shape of inverted gourd. It covers an area of 212 square km. With the deepest point of the 157.8 meters and the average depth of 87 meters, Fuxian Lake ranks the 1st in Yunnan and the 2nd in china in terms of depth, it is second only to the deepest lake in china - the volcanic crater lake of Changbai mountain (cháng bái shān tiān chí 长白山天池) in northeast china. It is the 3rd largest lake in Yunnan Province (the largest lake in Yunnan is the Dianchi lake (diān chí 滇池) and the 2nd largest one is Erhai lake (ěr hǎi 洱海). Its total water capacity is 18.9 billion cubic meters which is 12 times of Dianchi lake and 6 times of Erhai lake. It is a half-closed plateau lake, so the water of the lake comes from the surrounding streams and rivers, underground springs and rainfall. The lake is so clear that the deepest visibility can reach 12.5 meters. 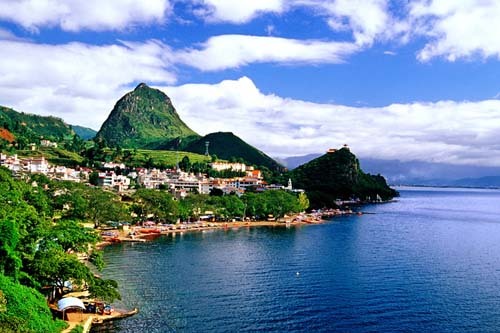 Thus the water quality of Fuxian Lake ranks the 1st in Yunnan and it is also one of the clearest inland fresh lake in China. The name of the lake -Fuxian- means to attract immortals. It is said that rocks resembling two immortals stand in the southeastern beach of the lake. It seems to indicate that the lake is so charming that everyone including immortals would be completely enchanted with it. 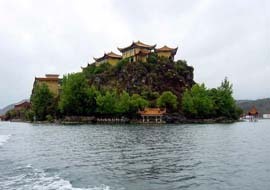 The main scenic spots around Fuxian Lake include Luchong village (lù chōng cūn 禄充村) in the west, the Hot water pond (rè shuǐ táng 热水塘) in the east, Xiangbiling Hill (xiàng bí lǐng 象鼻岭) in the north, Haimei river (hǎi mén hé 海门河) and Gushan island (gū shān 孤山) in the south. 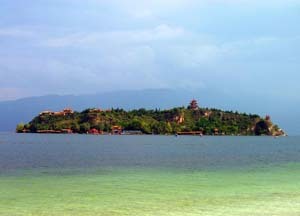 Situated in the south of Fuxian Lake, Haimen Rivers links Fuxian Lake and Xingyun Lake (xīng yún hú 星云湖). Although Haimen Rivers is only one kilometer long, it is an absolutly valuable place to visit. 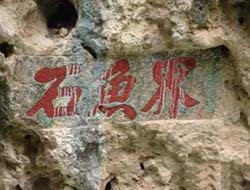 There are three Chinese characters on the rivers bank - "jieyushi" (jiè yú shí 界鱼石), meaning "fishing separeting stone". Maybe people will have a question--why are they written here? In fact, such a special name comes from a unique phenomenon - the fish in Xingyun lake and Fuxian Lake never swim across the Jieyu Stone. It seems that they understand the stone as the boundary of the tow lakes. It is said that Emperor Qianglong (qián lóng huáng dì 乾隆皇帝) in the Qing Dynasty wrote the three characters on the stone to mark the wonder. Lying in the weatern shore of Fuxian Lake, Luchong village is reputed for its tranquil beach, banian trees and hospitable villagers. Here people can enjoy the beautiful scenery of Fuxian lake and penholder-shaped Bijia hill (bǐ jià shān 笔架山), also can play some interesting aquatic games. Kanglang fish (kàng làng yú 抗浪鱼) is one of the essence of Fuxian lake, which cannot be found in any other lake or sea around the world. It is a unique species. A Kanglang fish is less than 20cm long. “Kanglang” means “to fight against waves”, since Kanglang fish like to against waves. There is a great deal of wind and rolling waves on Fuxian lake, and the lake used to be teeming with Kanglang fish. The fish swim from deep water to shallow waters near the bank to spawn every year from the beginning of spring to the beginning of autumn. So the fish season lasts from March to September. People make full use of the fish’s habits and characteristics in fishing. Wooden water wheels are used to pump water out of fish caves, and Kanglang fish will swim against current, then into the fish cages placed in the water beforehand. Living in the high quality water of Fuxian lake, Kanglang fish is delicious and fresh. 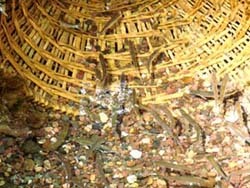 The fish can be air-dried, salted, deep-fried, steamed, or boiled in copper pots. However this fish species is nearing extinction due to overfishing in recent years. So the price is very high, and the way of the sale is also strange. Due to the fish live in pairs, they do everything in pairs including swimming, eating and spawning like a couple of lover, so the local people sell the fish in pairs for respecting their love. Besides Kanglang fish , another important local product is lotus root starch (ǒu fěn 藕粉). The local lotus are famous for being big, stout and sweet. Being made of fresh lotus roots, the lotus root starch is sweet, glutinous, smooth and fragrant.